Bryant, Mark (2004). "Partner, Matriarch, and Minister: Mme de Maintenon of France, Clandestine Consort, 1680-1715". In Campbell Orr, Clarissa (ed.). Queenship in Europe 1660-1815: The Role of the Consort. Cambridge University Press. pp. 77–106. ISBN 0-521-81422-7.
de Rouvroy, Louis. St. John, Bayle (ed.). The Memoirs of Louis XIV., His Court and The Regency, Complete. Stephens, Henry Morse (1911). 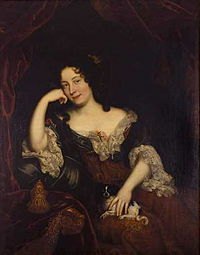 "Maintenon, Françoise d'Aubigné, Marquise de" . In Chisholm, Hugh (ed.). Encyclopædia Britannica. 17 (11th ed.). Cambridge University Press. pp. 442–444. Wikimedia Commons has media related to Madame de Maintenon. Wikisource has the text of a 1921 Collier's Encyclopedia article about Françoise d'Aubigné, Marquise de Maintenon.